Your quilt backing must be 4" longer on each side! We need those extra inches to properly load your quilt! Please specify the top of your quilt! Sometimes it is hard to tell which is the top, especially with square quilts! When preparing your backing, make sure it is trimmed and squared up. This will ensure your backing gets loaded straight - and the design that is being quilted will be square. The ideal backing seam is 1/2" - 5/8" - If you need us to sew your backing there will be an additional charge. Please cut any loose threads on your quilt top and backing - this will prevent our quilting foot from getting caught in the threads and potentially getting a rip in your quilt. If your quilt top has seams along the edge - it is a good idea to sew a basting stitch (about 1/8" in from your quilt) all the way around your quilt to prevent any seams from coming undone. If your quilt top has borders - make sure they are sewn on correctly - if there is too much fullness in your border - we will do our best to work out the fullness, but we can't guarantee there will not be any puckers or tucks in your border. For information on sewing borders on properly - here is a great tutorial. Please specify if your quilt top or backing has a top or bottom. Or if you want your backing seam running a specific direction. Quilt top must be free of any embellishments - such as buttons. If your quilt has appliqué, make sure it is properly secured to your quilt. It it is not, our needle will catch on the sides and turn up your corners. If you are shipping your quilt, please place your quilt in a plastic ziploc bag or something similar to protect your quilt! 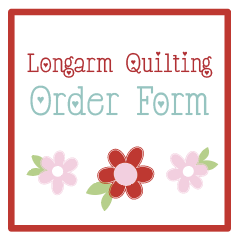 If we have any problems, or have a question regarding your quilt - we will contact your right away!